30, of South Portland, Maine; assigned to the 3rd Squadron, 61st Cavalry Regiment, 4th Brigade Combat Team, 4th Infantry Division, Fort Carson, Colo.; died Oct. 3, 2009 in Kamdesh, Afghanistan, of wounds suffered when enemy forces attacked his contingency outpost with small arms, rocket-propelled grenade and indirect fires. Also killed were Sgt. Justin T. Gallegos, Spc. Christopher T. Griffin, Sgt. Joshua M. Hardt, Spc. Stephan L. Mace, Staff Sgt. Vernon W. Martin, Sgt. Michael P. Scusa and Pfc. Kevin C. Thomson. 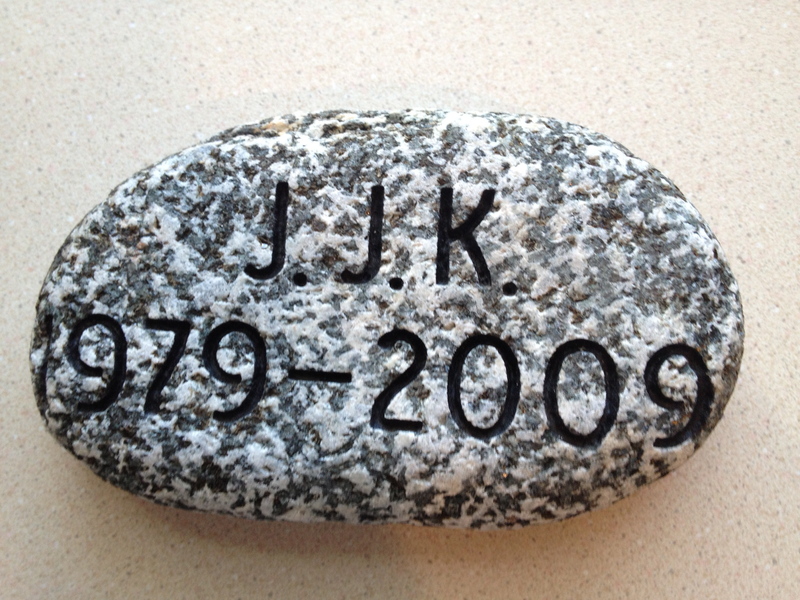 To honor SGT Joshua J. Kirk, his uncle Mr. Jerry Dinsmore retrieved this stone from the east branch river of the of the Oyster Lake near SGT Kirk’s birthplace in Thomaston, Maine. Also to honor SGT Joshua J. Kirk, his mother Bernadette Kirk-Bonner retrieved this stone from the Moyie River in Moyie Springs, Idaho. “I am Bernadette Kirk-Bonner and the proud Gold Star Mother of Sgt. Joshua John Kirk who was killed October 3, 2009 at COP Keating, located in the Kamdesh District, Nuristan Province, Afghanistan. The stone that you are carrying today was taken from the Moyie River in Moyie Springs, Idaho. Joshua and his family lived and played beside this river from the time he was four until he grew up and left home at age 21. Joshua and his 5 siblings (4 sisters and 1 younger brother) spent many wonderful summer days on the river, rafting and swimming. This stone is a reminder of those happy times. 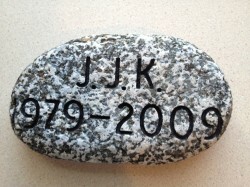 This stone also signify his love of rock climbing. When he was 19 he attended a Colorado Outward Bound 30 day mountaineering program. He returned with a passion for rock climbing as well as a deeper love for the wilderness he grew up in. If he were alive today I know that this is a journey he himself would undertake on behalf of the fallen. The mountain you are climbing today is significant on another level as well. While in our twenties, his father and I climbed this mountain and had our picture taken at the top. John has since died and I am too old to climb with you today but rest assured, we are both with you in spirit. Kirk’s men saw him as being unafraid, unthreatened, and, at times, unrestrained. During firefights, he would tell them, “If you think you need to shoot something, shoot it. It doesn’t matter how much ammo you might waste. If you need to kill it, kill it.” Most of the guys at the outpost were tough, but Kirk, he was crazy brave-fearless. Absolutely. Kirk had been born at home in Thomaston, Maine, the son of a Vietnam veteran who transformed himself from the dope-smoking head of a motorcycle gang into a born-again Christian carpenter. When Josh was five, the family moved to fifteen acres of land not far from Bonners Ferry, Idaho, a small town best known for U.S. law enforcement’s siege of a compound at nearby Ruby Ridge in 1992. The Kirks had running water but no electricity; their closet neighbors were five miles away. Joshua and his five siblings were homeschooled. Their entertainment was entirely self-created; building forts, sleeping in tents, playing flashlight tag, and, when they were teenagers, engaging in elaborate games of war. One such game, invented by Joshua, came to be called Test of Courage; it basically consisted of devising terrifying tasks and daring the other players to attempt them. The challenges started out harmless enough but then quickly escalated to dangerous acts such as exploring an abandoned silver mine, walking on top of the old Eileen Dam, and body-surfing fierce river rapids. In retrospect, it seemed astonishing that no one had ever died. Kirk was back in in Afghanistan pretty quickly. He had been entitled under Army “stabilization” rules to have twelve months at home. He had returned to Afghanistan before he was required to. “I wasn’t going to let my soldiers come here without me,” Kirk, a team leader, explained. Hello, My name is Tom, My wife Amy and I are proud members of the Patriot Riders. We will be extremely honored to carry Joshua’s memorial stone. I wish to thank Joshua and his family for your ultimate sacrifice. We are so proud of him, God bless him. He will never be forgotten. After learning about Joshua, I think he would love this journey to the top of Mt. Katahdin. I was the scout who gave you Joshua’s stone. It was nice to meet you and I am happy we did team work to get Joshua’s stone to the mountain. Thank you again for taking the time to honor Joshua. I am a Webelos 2 and I represented your loved one on 5/23/14 when the motorcycles took off to Mount Katahdin. I was the one who gave a rock to the motorcycle couple and they drove off with the special rock. I will be praying for you and your loss. My resistance was not through lack of interest, but rather because I thought as a civilian I would be infringing upon (quite literally) sacred space. Even as the weekend approached and I met others associated with the project and heard the stories about those we were honoring I felt that it was not my place to be among this group. As the weekend progressed, however, the barriers I thought existed between the armed forces community and the civilian one slowly dissolved. This happened for two reasons, I think. One, we were all committed to the same mission: to honor Maine’s fallen service members and to support their families and loved ones in doing so. And second, and what really hit me during the hike and after, is that I had in my mind this image of Sgt. Joshua Kirk, in whose memory I hiked, as being a superhero. I imagined him being like a fictional G.I. Joe character and it was hard to feel a connection that. Here he was, fighting tooth and nail at some distant desert outpost on my behalf in a world and environment that I could not possibly comprehend. I might as well have been hiking in honor of Captain America. But as I made the trip up the Owl Trail with Megan Kirk, Josh’s wife, she told me about Josh the father, Josh the husband, Josh the neighbor and family man. Suddenly he did not seem as much like the image I had built up in my mind and more like the kind of guy you’d see at the hardware store on the weekend or go fishing with. As I talked with Megan, it became clear to me that she wanted Josh to be remembered as a hero, yes, but not as a caricature. She wanted him to be remembered for the special person he was every day, not just when he was fighting on our behalf. And with that conversation, I felt the divide between Megan’s military family and my civilian family lessen. I can never imagine what it would be like to lose a loved one in a war or to even have a loved one overseas or to be there myself. There are certain things about the military lifestyle that I will never be able to relate to nor necessarily should I since I haven’t been a part of it. But I am happy that through the Summit Project we were able to (hopefully) show military families that there are many in the civilian community who support and respect them not just on holidays or special occasions, but all the time. In return, I was grateful for the opportunity to get a close look at what life is like for these families. We did the hike on Memorial Day weekend and I distinctly remember Megan looking at me and saying, “Every day is Memorial Day for us.” That really hit me. As an elected leader in Bangor, Maine, I worry that America’s veterans are being used as political fodder. I remember one retired service member saying that veterans are “American politician’s favorite chew toy.” I think it is important that we make efforts to really understand our veterans’ concerns and those of their families and to tackle the complexity instead of just waving a flag, slapping on a pin, and saying patriotic words and phrases. It is comforting to think of our service members as red, white, and blue all-American heroes, and of course they are, but they are also just American citizens like you and me who have chosen to do extraordinary things. To me that makes the act of military service all the more amazing and yes, heroic. I will be forever grateful for the opportunity to share in Sgt. Kirk’s memory. I offer my thanks to his family for sharing their stories with me and to David Cote for organizing this wonderful project. I hope to continue to be involved in the future and to work to bridge the gap between military life and civilian life. In June 2014 I participated in the Trek Across Maine, a 3 day/180 mile bike ride from the mountains to the sea. This annual event supports the American Lung Association’s good works promoting healthy air, and as a regular participant I also rode to honor my dad’s memory – he was a military veteran like me. This year was particularly meaningful to me because I also carried a memorial stone for Army SGT Joshua Kirk. SGT Kirk met his future wife Megan near my home in South Portland, so I felt a connection even before learning about his life and service to our country. Prior to the ride I learned as much as I could about SGT Kirk from the TSP website and from conversations with his widow Megan. She is a gracious & powerful woman who wears her loss with dignity and purpose. During the three days of the Trek SGT Kirk’s stone was with me continuously, and I shared his story with over 100 other riders along the way. Many people took time to hold the stone, snap a photo, and hear the story of Josh’s service and sacrifice. This showed me the real meaning of creating a living memorial. And on the second night of the Trek over 1500 people heard about TSP at a rally attended by all the participants. After the ride I met Megan and her daughter Kensington in person, and shared some of my experiences from the Trek. I told them about all the people who heard SGT Kirk’s story, and the way they responded with respect and appreciation for his service. It was very moving to be with them after carrying the stone. While the idea was initially intellectual, it quickly became real once the stone was with me. In fact, it felt strange to return the stone after the ride – it had become part of my life for those few days. To SGT Joshua Kirk: Thank you for your service, for your courage & sacrifice, and for stepping up to support and defend our nation. You paid the ultimate price, and no matter what others may say about the conflict that took your life they cannot lessen the impact you made and will continue to make through keeping your memory alive. To Megan Gavin-Kirk: Thank you for showing us how to grieve through celebrating Joshua’s life rather than solely by mourning his death. You set an inspiring example for your daughter and others who learn of Joshua’s story. Through your actions you are the embodiment of a living memorial. To Kensington: Your daddy gave his life for his country, and sadly he will not be with you as you grow up. But his spirit will always be there with you. It’s clear you are an amazing girl and you will thrive and grow into a woman of purpose like your mom. I hope the living memory of your father will be a positive influence in your life. I was honored to carry SGT Kirk’s stone and be a part of The Summit Project. It’s real, it matters, and it connects on a level way deeper than words can express. If you have even a casual interest in participating…go for it. You won’t regret it! My name is Rob Dinwoodie, and I am a Captain in the Marine Corps and Operation Iraqi Freedom Veteran. I had the honor of carrying one of Joshua’s memorial stones up Owl Mountain during the Summit Project at Baxter State Park on Memorial Day weekend. In the weeks leading up to The Summit Project hike, I learned everything I could about SGT Kirk on the internet, in books, and through correspondence with his Uncle, Jerry Dinsmore. The narrative of SGT Kirk’s life and sacrifice is inspiring and has put my role as a Marine Officer and the true nature of leadership into greater perspective. SGT Kirk exemplified all that is expected of a military leader; tough, caring, smart, and brave. Above all he was dedicated to his soldiers and did everything, including giving his own life, to save his men. He lived the warrior ethos of Honor, Courage, and Commitment, and reminded me that regardless of my duty station and job, I need to as well. I am currently stationed at the Pentagon in Washington D.C., far away from the front lines. Every single day, for the past several years, I drive three miles to work and park next to Arlington National Cemetery. From there, I walk one mile to the Pentagon entrance, past thousands of headstones where heroes are buried on this nation’s most sacred ground. After walking under a tunnel I emerge at the Pentagon Memorial dedicated to those 184 souls that died on September 11, 2001, when hijacked American Airlines Flight 77 slammed into the building. Every day, I look at the Pentagon and notice the different colored limestone denoting the parts of the building that were rebuilt after the attacks, and the limestone that has been there since the Pentagon was built in 1943. Every day, I walk through the halls that 13 years ago were a smoking ruin, and where the first blood was shed in the war against terrorism. Every day, I make the same return trip to my car, but in the afternoon, I walk past hundreds of tourists visiting the Pentagon Memorial. The Pentagon wall’s limestone, the Arlington National Cemetery headstones, and the memorials to the victims of 9-11 all speak of great sacrifice, but I have grown accustomed to their presence and ignorant of their true weight. Unfortunately, the mundane nature of my daily routine has made me forget the enormous weight of the sacrifices that are testified in the monuments around me. The true weight of these war’s sacrifices became tangible again- and my sworn duty to support the warrior’s on the front line in all of my daily actions- when I held Sgt Kirk’s memorial stone, felt its texture, and read his name, rank, and life span. When I carried the stone up Owl Mountain I was reminded that the weight of war’s sacrifice is real, all around us, and borne by many, many people. It was truly an honor to be a part of the Summit Project and meet all the amazing people involved. It was an honor to carry the memorial stone of your loved one, SGT Kirk, and a true privilege to learn about his life and his warrior spirit. It is now my duty to help keep his memory alive, and I will tell his story for as long as I can. SGT Kirk has left an indelible impression on me and I will never forget the true weight of his sacrifice. Thank you .. I salute you Sir. I was asked by my sister, Cherie Sackville of Scarborough, Maine to look at this website prior to our annual hiking trip in the White Mountains. She encouraged me to take on this added responsibility. She committed to carrying Capt. Jay Brainard’s stone. At first I was reluctant. I am a novice hiker and the thought of carrying extra weight was a little daunting. However, once I viewed the Summit Project, I immediately scrolled through the bios and was amazed at the heroism and sacrifice and I thought it was the least I could do to carry a stone up a mountain. So, after reading Sgt. Kirk’s bio and listening to his widow’s video, my connection was made and I committed to this whole-heartedly, knowing that this was a small sacrifice to make after reading all of the personal stories of pain and loss that these heroes and their families have endured. Our first day up Valley Way to Madison Spring Hut in the White Mountains was exceptionally humid and hot. The trail is shrouded in trees so it doesn’t get much breeze. I knew I was running low on water and I was struggling to make the last mile. I was sure that I was reaching dehydration or heat exhaustion. My coordination was getting unsteady so we stopped again for a break. I was sure we weren’t going to make it. However, as part of our girls trip, I packed a little wine for our mountaintop reward. I said out loud, “Only I would bring more wine than water. If Jesus can turn water into wine, I sure hope he can turn wine into water.” No sooner had we put our packs back on and taken two steps and my sister yelled, “Oh my God, there’s a bottle of water!” It had fallen out of someone’s pack and rolled off the trail. We both started jumping up and down. I started to cry. It was as if it had been sent to heaven. Cherie looked at me and said, “It’s from our guys!!! They’re looking out for us! !” We simply could not believe it but it powered us through the last mile up to the hut safely. The hut croo allowed my sister, Cherie to do a brief presentation of The Summit Project that night after dinner and we displayed our stones for all 52 people who were staying there that night. I had printed out Sgt. Kirk’s bio and people were genuinely interested in the project and the lives of those soldiers who were with us that trip. I was proud to be able to explain the project and what it meant to both of us. The next day we continued on the Gulfside Trail toward Mt. Washington for 6 miles. Everyone that we spoke with at the hut the night before this day told us it was difficult but that’s not what we had read about or was mentioned in planning this trip. We knew it would be a long day but worth it because we would be summiting Mount Washington with our stones. The weather was starting to roll in so we were hurrying to avoid the afternoon thunderstorms and eventually made it eight arduous hours later to the top. It was the hardest thing I have ever done. The weight of the pack was inconsequential knowing what others have sacrificed for me. It was a journey that I will never forget and I am honored and humbled to have carried the stone of Sgt. Joshua J. Kirk. I hope I have carried on his spirit of adventure and commitment to excellence that makes me proud to say he was part of my journey and a life story that I will continue to share for many years. Hi Debbie, This is a great story. I’m sure Jesus was looking out for you and Sgt. Kirk…you left no stone unturned. Hi Megan, Wanted to let you know that I have your husband’s memorial stone. I am a critical care nurse at MMC, in Portland. Another nurse and I did the Run for the Fallen this past Sunday where I learned about the Summit Project. Since I live near SMMC I decided that I would bring Joshua’s memorial stone on my hike this thursday. Your story of how you met at the school was wonderful, I jog by the school a few times a week. My sister is turning 50 thursday, on for her birthday she wants to hike Mtt Katahdin, so that is what we and 8 other friends are doing. It is her first time up the mountain ( I have been up it 8 times) so Joshua is coming along. I plan on posting pictures to the facebook website with Sgt Joshua Kirk’s journey up a mountain with 8 women. From listening to your video, talking about him, I think he would be up for the adventure. Some are experienced hikers other first timers. I is an honor to carry his memorial stone. All the girls will learn all about him. My name is Doug Kerr. I want to start off with saying that this will not be eloquent or pretty. But, then again, neither was the run I did. I first heard of the Summit project while participating in the Run For the Fallen this year. Maj Cote was filing into the crowd at the start of the race and was talking with another runner. The discussion of whose stone they carried was intriguing. It was obvious that those involved were excited and proud of what they were doing. Post race, Russ Shoberg, my wife Charissa, and I made our way over to the table of rocks. We spoke at length with Ben and Dave about what the project was about, and certainly we were moved. At the time I think I was unsure of where it would move me. That afternoon was beautiful, the food was wonderful, and the band played on. As usual, there were many hand shakes and thank you’s for service and sacrifice. That event is so moving, I have a hard time communicating what it means. Those RFTF events make the short list of the most important things I do these days. Senior veterans, young volunteers, sharp and rigid Marines, Brunswick FD, and masses of people all to honor our heroes we have lost, and support the ones they have left behind. I honestly don’t know what to say when family members tell me thank you. They’ve got it all backward. For 4 years now Russ and I have been floored by the unity we feel during these events. God bless them all. One beautiful young lady accompanied by her even prettier daughter stopped me to comment on my ACU kilt I doned for the occasion. When I told her I had made it, and made it from the uniforms of our proud soldiers, she told me she loved the idea. She was wearing an all too familiar Running In Memory of shirt, and when I asked her who he was, she proudly stated it was Sgt Josh Kirk, her late husband. I fumbled over my condolences and thanked her and her daughter for what they have given up for the rest of us. A few days passed when I got the message from Russ that he had dropped an app to carry a stone during his 10th consecutive Maine Marathon. I had been toying with the idea, but didn’t know if it fit with what TSP was doing. Since he reached out, I figure why not make it two. Maj Cote picked stones for Russ and I to carry, Cpt Ben Keating for him and Sgt Joshua Kirk for me, and informed us that they were tied together, go figure out how. Russ and I had an inspiring few days of independent research into our soldiers. I watched Megan’s video probably 10 times, and read Josh’s bio on TSP over and over. I ordered The Outpost – a rich and detailed telling of the remote post in Afganasthan where both of our soldiers, 3 years apart lost their lives defending my freedom. I scoured the web and ended up talking with Megan online. I wanted to let her know that I was going to be running with his name in my pack, and his story in my heart. Amused that we had already crossed paths, it turns out that she was running as well as a warm up to the Maine Marathon. So strong. I was, and am, grateful for the opportunity to run not just for Josh, but for Megan, and for Kensington their daughter. The morning of the race I met with Russ at 5ish. He had picked the stones up from the Augusta armory where they were delivered by the Patriot Riders from Cadillac Mt. I carefully wrapped Josh’s stone back in it’s bag, wrapped that in an ACU sleeve (leftover from the kilt I was again wearing), and wrapped that in Ol’ Glory. Sir, you are riding safe today. Russ and I prayed for strength and to carry the stones with dignity and honor, and to hold the family of our soldiers in God’s loving hands. Prayer is an important part of our running, and this day would be no exception. I ran into Megan pre-race after separating from Russ and my family. I carefully unwrapped the stone so we could pose for a quick picture taken by mom, then carefully wrapped it back up. As the star spangled banner carried through the air, I presented arms as I had been taught a lifetime ago. The cannon let loose, and we were moving. I can’t tell how many times I told the story during the race of what I was doing with TSP. I know a number of people were just looking to say a quick comment about my kilt and then be off, but I like to seize those opportunities. I hope I inspired at least one person to look into TSP as we ran. I knew it was not a race for time for me. I was not well trained, had a couple extra pounds, and was more focused on my pack than the swiftness of my feet. I saw Russ heading long shortly after I had turned around for the half. Confident enough in our relationship with God, our wives, and our place that day, we gave a not-uncommon Love You Brother and we kept on rolling. Somehow Megan saw me shortly after and we wished each other the best as well. By that point I was definitely starting to drag. I didn’t have a bounce in my step, my pack rubbed my neck, and I missed my wife at the cheering point. Inward I go. For the remainder of the race I tried to focus on Josh. The stories I read of him I replayed in my mind. The lines his fellow soldiers said “I would follow him to Hell if he thought it was a good idea” repeated over and over. I imagined the weight he carried, and laughed at my own. I imagined the conditions he endured, and I looked around at the (finally) beautiful Maine morning. I thought about Megan and especially about Kensington. I prayed that Josh’s name will be carried on through them, and that they feel God’s sorrow for their loss. I stopped with a bit less than half a mile left in the race to pull the stone from my pack. I can only imagine what I looked like on wobbly legs throwing my shirt and jacket to the ground to insure the flag and stone remained clean. I repacked, resecured, and resumed, this time carrying the stone in hand. I carried it initials out. The weight seemed disproportionate to the size, and I think it was more than stone that I was holding. When I had crossed the line I was holding back tears. I was happy, remorseful, disappointed, and humbled. I found a quite peace of grass and thanked the Lord for sustaining me that morning. I prayed that he be with Russ and Megan as they continued on. I prayed that the ARNG that carried the rest of the stones would finish with strength, and be welcomed across the finish line under the applause all soldiers deserve. The story keeps going. I am lucky enough that I could return the stone. Megan and Kensington have to carry it every day. I want to thank everyone for the opportunity to be a part of this project. I have shared this story and what it has meant to me to anyone who would listen. In His name I pray for all involved in the TSP. This has been an honor to run for and with Josh. Amen. It was a distinct honor and privilege for me to carry Joshua’s stone on October 4 for the TSP at ANP event. Megan’s video testimonal and his mother’s comments painted an evocative picture of a bright, resourceful, humorous, and compassionate man. Having just returned from New York for the Tunnels to Towers 5K, I wore my new, “FDNY” hat on the hike in honor of Josh’s frequently wearing a Yankees hat in New England. Hiking with Josh’s stone on October 4 was particularly significant, as it landed so close to the fifth anniversary of his death. Having lost my mother seven years ago, I know how anniversaries can bring up a range of emotions. So, I thought often along the hike about Josh’s family and loved ones and what they may be experiencing, as they marked the fifth year of his loss. I also thought about how much Josh would have enjoyed being part of TSP. His mother had mentioned an Outward Bound wilderness trip Josh took when he was 19, that cemented his love of the outdoors and rock-climbing. As we scrambled up the face of Cadillac, I’m sure he would have been leading the way with enthusiasm! It was especially powerful for me to hike with two Gold Star families on October 4. We talk a lot about the courage and bravery of our men and women in uniform – which is well-deserved – but I’ve been profoundly influenced by the grace and courage exemplified by the Gold Star families involved in The Summit Project. Others in this forum have mentioned that we carry the stones one day, but the families of the fallen carry the stones every day. Their willingness to allow us to share in their husband/son/brother’s life is an incredible act of bravery and love. One of the most heartbreakingly profound moments of TSP was when I handed Josh’s stone to Mrs. Zimmerman. She mentioned how much she enjoyed reading these comments because “we don’t get new things from James anymore”. I’m eternally grateful to the Kirk family for allowing me to be part of their remembrance of Josh and to be able to pay tribute to him. This experience will stay with me for the rest of my life and I hope to return to carry his stone again. I am sorry for your loss of your loved one. His spirit will always be with us. When I carried his stone up the mountain, I felt like his spirit was with me. The mountain was hard for me to climb the long way around, but Joshua’s sacrifice was hard for you. We all appreciate what Joshua did for our country. I spoke about Joshua at the top of the mountain. I talked about his stone and where it came from. I saluted him at the top of the mountain for his sacrifice to protect us. I will always salute the Army and United States forces that have died at war. Hi I’m Renee, I’m a student at Edward Little High School. I had the honor to carry your husbands memorial stone up Bradbury mountain on November 14. Thank you for letting us take your husbands stone on our snowy wet journey up the mountain. When my teacher first told us about the summit project I got excited to have the honor to be able to carry the stone of a fallen hero up Bradbury mountain. To be able to show my respect to Joshua for sacrificing everything for our country, his men, and mostly for his family. Thank you so much for letting my class mates and I learn about your husband it was a great honor. Hi, my name is Kaily and I am a student at Edward Little High School. I had the honor to carry Joshua’s stone up Bradbury mountain. It was an amazing experience to be able to learn about Joshua and his story. I am so greatful I was able to take the day and honor him for his service and sacrifice, I could never thank him enough. Thank you for the opertunity of carrying his stone and allowing my class and I to honor him. I had the pleasure of hiking with Army Sgt. Joshua J. Kirk on 20, December 2014. This was to be one of my first solo winter hikes. Blessings to you and all who are doing this! Your vulnerability is inspiring as well as your strength! Such a beautiful story. So well written. Thank you for writing so honestly. Sounds like a good day .. Thank you. I had the honor of carrying the stone in memory of Joshua Kirk during TSP USM March on March, 6, 2015. Our 6 mile march through Portland took place on a sunny but cold winter morning. Although cold, it’s the kind of crisp winter day I love. From what I learned about Josh and his experiences in Outward Bound, I believe he would have also enjoyed to be walking outside on a day like that. Although I never knew Josh personally, I understand he was referred to as “the best of the best” in terms of his ability as a soldier. He was also a devoted family man to his young family and did his best to show how much he thought of them during his deployments. Megan seemed to radiate strength and dignity in her interview about Josh and I admire her for that. I wanted to participate in this TSP march because I understand the sacrifices and impact on the families of a fallen soldier. I too have lost a brother and a brother in law, both Marines, in deaths related to service. I thought about Josh’s family and their sacrifice as I walked. As I was surrounded by others carrying stones in honor of other fallen soldiers, it made me reflect on all the brave souls whose lives have also been sacrificed in order for us to live free. As a Veteran myself, I feel an obligation to remember the fallen; to help those who return from combat with injuries and battle scars; and to cherish the camaraderie of fellow Veterans who also chose to serve their country. Regardless of the politics surrounding the war, I think the men who served at COP Keating and OP Fritsche are nothing short of true heroes. That word is bandied about way too often, but in this case, there is no other word to me that encapsulates their bravery. These were mostly ordinary, small-town sons, fathers, husbands, and brothers who when faced with unimaginable odds, harnessed something deep within themselves to support each other and the mission. We owe them and their families a debt that can never be repaid. Hello, My name is Emily Gross it was an honor to carry the memorial stone in memory of SGT. Joshua Kirk. SGT Kirk was a american native of Thomaston Maine. SGT Kirk was killed in action during his second tour in Afghanistan, Leaving behind a loving wife Megan and their daughter Kensington. Though the hike was tough for me it was more than worth it. The weather was nice and warm with a cool breeze. Mount Bigelow was extremely beautiful. It was not an easy climb for me because I am not in shape. Also I did not know what to expect because I have never hiked up a Mountain before. So with that said I thought that i wasn’t going to be able to make it, But with a great support group from my fellow cadets I pushed through the pain and made it. I felt good about myself for being able to push myself to my limits for SGT Kirk. I knew that i couldn’t quit because SGT Kirk didn’t quit when he got tired. I was definitely inspired by SGT Kirk to make it to the top. I was also proud of myself to have been able to hike Mount Bigelow for SGT Joshua J. Kirk and the whole Kirk family. My name is Tony Llerena and on Sunday, May 24th, 2015, I had the distinct honor of carrying SGT Joshua J. Kirk’s memorial stone up the Owl Mountain in Baxter State Park. Megan, you handed me his stone the night before the hike and I wanted to make sure that no one was left behind, no matter what. Josh’s stone was one of two I carried. I stayed up late into the night learning about Josh and hearing the wonderful stories you shared about him. I only wish I had more time to know him better for the hike itself. From what I read, he was a great and thoughtful man, even if he was a Yankees fan. In all seriousness, Joshua was a wonderfully loving and thoughtful husband. I enjoyed hearing about his persistence in pursuing Megan’s hand in marriage, something I know a thing or two about, and also instilling Kensington with a love of reading. As a leader of men, I can’t get over his fellow soldiers saying they “would follow him to Hell if he thought it was a good idea.” That would be a sight to see! While the hike itself was moderately challenging, the ceremony at the summit was powerful and emotional. I thought about the little things that Josh did to let everyone know how much he cared. Joshua set a standard that, as a husband, son, father, leader, I aspire to achieve. Thank you for sharing your memories of him with me. Joshua is a hero I will never forget. On July 18th I carried SGT Joshua J Kirk memorial stone around the summit of Mt Washington. The weather was bad with no visibility. It was a special moment to have my picture taken with a person who died for us so we can have a better life. I also hiked the memorial stone on sunny days to 3 other smaller mountains. It was important to me to honor this brave soldier with the respect he deserves. I always feel that nature has a healing force. My name is Tara Lovely and I had the great honor of carrying the stone and the story of Sgt. Joshua J. Kirk to the summit of Cadillac Mt. on Saturday, October 17, 2015. Words cannot express the gratitude I feel for the fallen heroes who paid the ultimate sacrifice, and their families who live and honor them every day…I am eternally grateful. I was blessed to meet and hike with a great team of wonderful, genuine and loving individuals whose dedication to the cause will always stay with me. Army Sgt. Joshua Kirk, thank you for your service, your bravery, and your courage. You will not be forgotten. I will remember your extreme love for the outdoors and zest for life, your dedication to family and friends and your steadfast courage to bravely lead in the face of danger. I am humbled by this experience. On October 17, 2015 I had the honor of carrying Joshua’s memorial stone to the summit of Cadillac Mountain. I had never climbed Cadillac and was a nervous wreck! I was wide awake at 3AM ready to hike and honor the Hero that was chosen for me! The morning of the hike was beautiful. I arrived to base camp around 5:45. The sun was not yet on the horizon, the crisp October air blew across my face and I stood close to the bay knowing I was able to have this freedom because of the men and women we were about to honor. As the minutes went on I impatiently waited for the sun to rise. It was breathtaking! I knew this was going to be a perfect day. Everyone gathered for our pre-hike meeting and started toward our assigned bus. I looked Dave in the eye and said “Thank you for this day.” He was holding the Maine state flag. He looked at me and says, “here, would you like to carry this?” I of course grabbed the flag and found my way onto the bus. What an honor. Joshua’s stone and the Maine flag. That was not an easy mission! I was asked several times if I wanted someone else to carry the flag. My response was the same every time, “No, thank you. Dave handed me this to me. There’s a reason for that!” I however did have to hand it off a couple of times so I wouldn’t fall off the side of the mountain, but always grabbed it back when I knew I was stable! The hike was challenging and at one moment I was in the lead. On the trails in Acadia they are marked with a blue strip of paint. At one point I had a few of us off the trail. For some reason they followed me, maybe to make sure I wasn’t lost alone or they followed me because I seemed to think I knew what I was doing! Either way, it was a great time to use our teamwork and get back with our group! The flag made our detour even more challenging! At one point I think I hit someone with it! I warned all that were behind me that they may get hit! Our trail had two summits. Another team member had hiked our trail earlier in the summer to get a sense of what it would be like for us. He and I are great friends and shared many conversations about how our hike would go. As we were approaching the first summit I said, “Jonathan, wouldn’t it be awesome if there was a rainbow waiting for us at the summit!” Rainbows are significant to my family, we lost my best friend and first cousin in June 2007 to an IED in Iraq. The day of his death several family members saw rainbows. Now when we see a rainbow we say “Hi Joel!” And wouldn’t you know it! As we approached the summit there it was!! A beautiful rainbow! Barely peaking out of the clouds, but enough for me to know he was with me! It was a moment I could share with Joshua. He was a family man and I feel would have appreciated the ties to family through that rainbow! Upon reaching our second and final summit I was freezing, wet and shivering! The rain had subsided and the view was majestic! I thought of Joshua’s mother, Bernadette and father, John who had climbed Cadillac in their twenties. This is when all of the emotions of the day flooded me. I couldn’t help but think about Joshua climbing this mountain, having his photo taken overlooking the beautiful Atlantic Ocean. Knowing I made it to the summit with great pride and with the memory of a true American Hero. Joshua and his memory will never be forgotten. He is a man who those after me are going to be blessed to learn the memory of. After our circle at the top where our team comes together and shares the stories and memories of our fallen Heroes we gathered back onto the bus. It was a different feel on the ride down. Our mission was not over. Now we were heading back to base camp to present the stones of the fallen to either family members, a Patriot Rider or someone who is taking on the honor of receiving the stone. I knew Joshua did not have any family present and was not sure who would receive his stone from me. One by one we presented our stones. My turn came, I proudly walked into the middle of the circle of people and said “Today I carried the story and stone of Sgt. Joshua J. Kirk” with the upmost pride. I waited a minute and out walks this familiar face! I walked over to Jessica and she handed me the stone of my cousin Sgt. Joel A. House and she received Joshua’s stone to place on the table. That moment when two Heroes were exchanged flooded me with emotion. The similarities in personality made me realize, I may not have carried the stone of my best friend, but Joshua is a man who would have fit into our family perfectly! My name is Steve Sullivan. On the 8th of November I had the privilege of carrying the remembrance stone for Joshua in a veterans day road race and a hike to the top of Bluehill mountain. When I was first asked to take part in summit project I had very little idea of what it was all about, but was very interested. I did some research and decided it was a great way to show my personal appreciation to not just Joshua but all veterans. After reading the bio and all the comments written by others who had participated and family members it really started to mean more and more. For a race route that I had run countless times and a hike that I had done more than once made me stop to think how easily we can take things for granted. On the morning of November 8th I woke up feeling different about the task of running and hiking then I ever have before. Things were very different, I was actually nervous about doing something that I do all the time. As the race was getting ready to begin the National Anthem was sung and it gave me chills. All thoughts in my head were how lucky was I to have the opportunity to do this and its because of the sacrifice of men like Joshua. From everything I have read about him is that he was so brave, with such a high regard for honor and country. With every step I took that day in the race and on the hike I thought of him , and how thankful and great full I am. moved by the courage of the men and women of the armed forces that put their lives on the line to keep us free. My thoughts and prayers go out to the family and friends of Sgt. Joshua J. Kirk. I was very honored to carry the stone in the name of Joshua Kirk. On the walk I felt happy and proud to be a part of the event. When the stone felt heavy I just thought of why I was there and it got lighter. I was happy that everyone enjoyed the French toast I made for breakfast before the walk. When everyone was in the sharing circle, it felt like we were giving light to a world of darkness. I was asked to do it again, I would not hesitate even a little. I liked how we had to do research on our fallen solider. It was nice to look them up and write about them. This was very big to do that day because it’s wonderful to have that feeling in your heart and an important event for the Boys & Girls Club. Even though I couldn’t meet Joshua, I think he would have been nice and a good friend. When I agreed to hike Cadillac Mountain with The Summit Project, I wasn’t really sure what I had gotten myself into. My friend had some friends that were involved with the organization and I thought it sounded like a good excuse for a hike, so I signed up to go. And I’m so glad I did! I had the honor of carrying the stone and the story of Army Sergeant Joshua Kirk. As I hiked up the mountain, I was able to reflect on Joshua’s life and his service for our country. When the hike got tough and we were all helping each other climb over boulders and carrying each other’s packs when we needed help, I couldn’t help but think that Joshua would have been the one to take someone else’s pack and lend a hand to help a friend. When we got to the top of Cadillac and spent some time sharing the stories of our heroes, I was blown away by the stories of these men and women who had given everything for their friends, family, and country. As I learned Joshua’s story and later shared it on top of Cadillac, two things really stood out to me. The first was Joshua’s bravery. Known for never backing down from a challenge and actively seeking out adventure, Joshua’s bravery was evident. I think people would use a lot of different words to describe me, but “brave” is not one of those words, so I really appreciate when people demonstrate this kind of courage. And the second thing that stuck out to me was Joshua’s leadership. One of his friends wrote that they’d “follow [Joshua] straight to hell if he thought it was a good idea.” His men trusted him implicitly and he led by example. I am thankful to have been part of this experience with TSP. Not only did I get to go on an awesome hike and make new friends, but I got to join part of a something that’s bigger than myself. I am thankful to be part of the TSP family, and I will always carry Josh’s story with me. MHANF. On Saturday October 1, 2016 I had the honor & privilege of carrying the story and remembrance stone for Joshua up Cadillac Mountain in Acadia National Park. This was my first hike with The Summit Project but far from my first hike in Acadia. I live here on Mount Desert Island and hiking is my favorite past time. I must admit of all the hikes I’ve ever taken in Acadia this was by far the most memorable to me. We hiked up the West Ridge Trail of Pemetic Mountain and down the other side via the Northwest Trail and then rose again to the summit of Cadillac Mountain. Both west trails were among the toughest I’ve hiked here in Acadia but I didn’t mind the challenge one bit. I was on a mission to honor Josh’s memory. I knew from learning about Josh he would have loved the hiking challenge as much as I did. Learning about Josh and his service to our country was eye opening for me. I have heard of the fallen heroes through news reports, etc. but have never experienced a loss in my personal life of someone serving in the military. I took Josh’s mothers suggestion and bought the book “The Outpost”. I have read excerpts from it that pertained to Josh but I have made a promise to myself to read it in it’s entirety. It’s important to learn all aspects of Josh’s life to understand the whole story of Josh. By doing so it helped me understand who Josh was and understand his dedication to our country. I thank Josh for his service and for his life. Josh was an honorable, devoted, courageous soldier and leader that anyone would be grateful to have as a friend. If there was a picture in the dictionary next to the word “Valor” you would find a picture of Sgt. Joshua J. Kirk there. By carrying his story and stone along the trails in Acadia made me understand the importance of honoring and remembering each and every soldier’s life that we have unfortunately lost. My thoughts and prayers go out to every member of Josh’s family as well as to his friends for losing such an incredible person way too early in his life. I will cherish my experience in honoring Josh’s life. I hope to join the TSP in the future on another memorable hike to the summit. We need to make sure all the heroes are not forgotten. Hello my name is Scott Parsons, I am Retired Navy and on November 13, 2016 I had the honor & privilege of carrying the story and remembrance stone for Joshua at the 3rd Annual Veterans 4 miler race in Ellsworth. It was truly an Honor to carry this stone for a young man who gave his life for this great country. I was suppose to carry a different stone but Joshua J Kirk showed up in his place. I read the story about Joshua and the kind of person he was, it was truly an Honor to carry his Stone and pass on his story, his memory will carry on and he will not be forgotten. I would like to Thank you and your family for allowing me the Honor of carrying his Stone. I would like to Thank you, your family and your Son for your service. My name’s Noah Hoyt from Nokomis High school. I climbed Little bigelow with Sgt joshua j. Kirk’s stone on Friday, May 12.The climb was great; the view from the summit was beautiful. It was an honor to carry his stone and to learn about him. He lived in Idaho for most of his life and went to a contingency outpost in Afghanistan. His men said that he was “unafraid, unthreatened and, at times, unrestrained”. I look forward to reading the book about him called “The Outpost: An Untold Story of American Valor”. It was a true honor to carry his stone. As I ponder about Joshua and our walk together, many different thoughts come to mind. I wonder how many times he has walked beside the carriers of his stones and urged the person to continue their journey together for only an hour or so, or many strenuous hours. Did the person falter or wonder what was I thinking climbing this mountain or walking on this hilly trail? As Joshua spoke to them in a soft voice he reminded me and others that it is in remembrance and honor of me and my comrades who also gave their lives and still giving their life that you can have the freedom to walk in this country that we all love so much. Joshua lived his life and gave his life without fear. To his mother I say Thank You for raising such a strong man in his heart, in his beliefs and his capabilities. To his wife I say Thank You for (as the song says) Stand By Your Man as you did and continue to do in your heart. I had the honor of carrying Joshua’s stone this past weekend on an obstacle course race. I was originally supposed to compete with someone, but she recently lost her brother-in-law who was serving overseas and was killed in Somalia. That said, carrying Joshua’s stone, honoring him with a living memorial, was an incredible experience that day. Not knowing what obstacles were ahead, I was reminded how many times Joshua must’ve been in the same situation, but different circumstances. I conquered every one of them without fear, just as Joshua would have, carrying his stone with me through all of them as a reminder. This project is a truly humbling experience, and I thank Joshua’s family for raising such an incredible human being. When I picked up the stone with my 3 year old, I told her Joshua’s name and that he passed away protecting all of us. His legacy will live on. MHANF. Thank you. I would like to personally thank you for sharing Joshua and his life with us and others who take part in this amazing program. My name is Lisa Jean, and on Saturday, October 14, 2017, I had the honor and the privilege to carry the stone and the story of Army Sgt. Joshua Kirk, to the summit of Cadillac Mountain in Maine. This event was part of the TSP at ANP 2017 group event. I want to offer my sympathies to the family and friends of Sgt. Kirk. Joshua was KIA at such a young age, 30 years old, at the prime of his life. From the research I did on Joshua, I feel that he would have made a great friend to all of us involved in this group hike. Joshua loved the outdoors, swimming, rafting, rock climbing and a deep love for the wilderness. Myself and our group of fellow hikers would have loved to have Joshua along, and in a sense he was with us, as I carried his stone, and as I spoke of him at the summit, during our circle ceremony. I will definitely read the book entitled “The Outpost; An Untold Story of American Valor”. Joshua’s mom said that everything we need to know about Joshua was written in this book. I read the excerpt that Joshua’s mom, Bernadette Kirk-Bonner, wrote about, during my circle ceremony reflection at the summit: Kirk’s men saw him as being unafraid, unthreatened, and, at times, unrestrained. During firefights, he would tell them, “If you think you need to shoot something, shoot it. It doesn’t matter how much ammo you might waste. If you need to kill it, kill it.” Most of the guys at the outpost were tough, but Kirk, he was crazy brave-fearless. Absolutely. After reading all of the information I found about Joshua, I got a sense that he was much more than a Sgt. in the Army, although he was proud of his service to his country. Joshua was a great family man, he did not have the easiest upbringing, but he made the most of everything, and to this he was the proudest. Proud to have come so far, proud to be serving his country, proud to have such a loving family and proud to have such dedicated soldiers by his side. This day 10/14/17 had something in store for me that I won’t forget anytime soon. I was supposed to hike just one memorial stone for USA SGT Corey Dan. Today I had the honor of hiking a second memorial stone of USA SGT Joshua Kirk. I voluntarily hiked this second stone and had zero time to research him before we left. This really bothered me as we hiked along the Bubble trail at Acadia National Park. I knew someone had to hike the stone so I did. All I could do is wonder what kind of man he was all day. When it was time at the end of the hike to talk about our soldier I had nothing! Even though it wasn’t my fault I felt like a failure! So when I returned home on Sunday I hit the internet. What I learned is Joshua was a real go getter! He was a true adventurer and was always testing not only his but his siblings courage a bravery when they played their crazy games and stunts! He was a true leader that led by example and was there for his troops and friends. Maybe someday I’ll get to meet some of the Kirk family hopefully. Until then I want you all to know that Joshua will always have a special place in my heart and will be thought of often in moments of sadness and joy. This last weekend I had the honor and privilege of caring your son stone in the Millinocket marathon. I believe caring his stone give me a little extra burst of energy when I needed it. When I felt as I needed to give up it was like he was there telling me and pushing me, saying never give up you can do it, you can make it. Over the complete weekend I took your son to the American Legion Hall were dozens of people ask me about him and his story, then I ran in the marathon the next day and again dozens of people asked me who he was and wanted to know more about him. I will continue to educate people about him, who he was and how he motivated other people in his unit to be better at what they did. I thank you and I am honored to have the privilege to have been able to carry his stone, to complete one of my dreams running in a marathon and again I thank you very much for the honor and privilege. On September 28th, I hiked to the top of Cadillac Mountain and was honored to carry Sgt. Kirk’s Stone and then share his story with others at the summit. What a privilege it was to learn about his life through many wonderful stories, letters, and articles which detailed several aspects of his life! The Summit Project is not a hike, it’s heroes like Joshua continuing to impact the lives of so many. Two things were clear about his life – he loved his family and he loved his country. I learned how he grew up with 5 brothers and sisters, being home-schooled by his mother. He loved to learn, loved history and reading. When he was older his father taught him carpentry, and over time he became very skilled even joining in the family business for a period. He challenged himself, always pushing to go the extra mile. He loved the outdoors, especially hiking and mountain climbing. He was also a loving husband to Megan and a wonderful father to his daughter Kensington. Joshua enlisted in the Army and completed a 15-month tour of duty in Afghanistan. He was extremely committed to serving his country and not long after returning home, decided to enlist for a second tour. He was proud to serve his country, extremely loyal and always ready to defend our country to preserve our freedom. He was even given the nickname “Combat Kirk” because he was always geared up and first out the door when there was any kind of action. He was awarded a Commendation Medal for sustained acts of heroism and for valorous actions in direct contact with an enemy. I can’t imagine what it takes to earn such an award. Sgt. Kirk truly is a hero and filled with valor! It’s been extremely humbling to learn of life and I’m beyond grateful to him and to others who continue to defend our country. I am also forever grateful to the families of these heroes, knowing that they too sacrificed so much. I was honored to carry Joshua’s stone up that mountain and will carry him with me for the rest of my life. I promise to continue sharing his life at any opportunity and to never take for granted my freedom.